Hundreds of papers and hundreds of factors attempt to explain the cross-section of expected returns. Given this extensive data mining, it does not make any economic or statistical sense to use the usual significance criteria for a newly discovered factor, e.g., a t-ratio greater than 2.0. However, what hurdle should be used for current research? 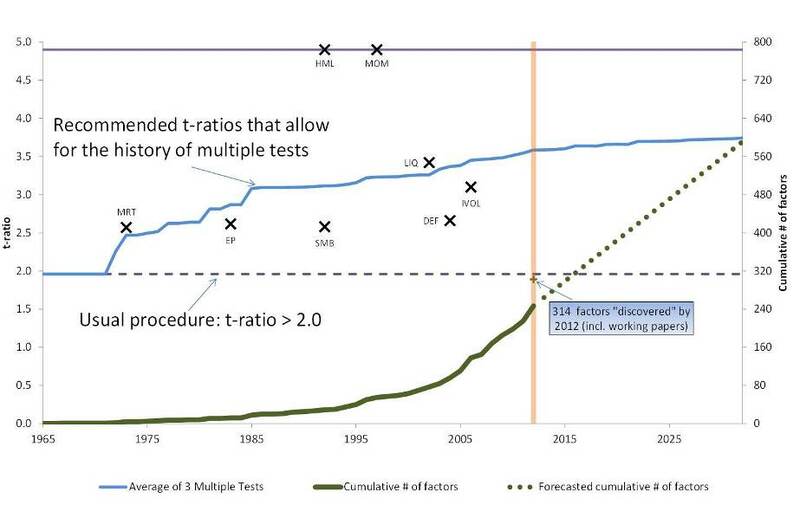 Our paper introduces a multiple testing framework and provides a time series of historical significance cutoffs from the first empirical tests in 1967 to today. Our new method allows for correlation among the tests as well as publication bias. We also project forward 20 years assuming the rate of factor production remains similar to the experience of the last few years. The estimation of our model suggests that today a newly discovered factor needs to clear a much higher hurdle, with a t-ratio greater than 3.0. Echoing a recent disturbing conclusion in the medical literature, we argue that most claimed research findings in financial economics are likely false.